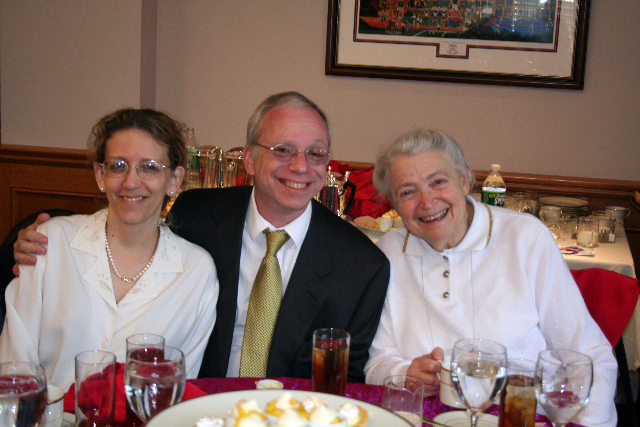 On the Jewish lunar calendar, today is the anniversary of my father’s death, and last weekend was the anniversary of my mother’s death. So it’s particularly poignant for me to be standing in a cemetery at this time of year, talking about someone we loved who is gone from the world and whose absence feels so painful. We think of a legacy as something handed down from one generation to the next. When we lose someone as remarkable as Millie, it’s hard to imagine that we all really do have a role to play in keeping her memory alive. But in fact, we do. As my brother and I have learned since the deaths of our parents, we can keep their spirits alive with our actions. We don’t need to get PhDs or run a lab in order to continue the work Millie started. Instead, we can emulate the behaviors she modeled for us. We can keep Millie’s memory alive by mentoring someone, or by learning about science, or by traveling to visit people who would benefit from our presence. If Millie was ever helpful to you, then in her memory, you can be helpful to someone else. If Millie ever opened her home to you, then you can try to open your home to someone else someday, in Millie’s memory. We can listen to music more often, in Millie’s memory. We can teach our children to play instruments, in her memory, or help fund music lessons for kids who otherwise couldn’t afford it. We can support scientists and scientific research. Be alert to the special challenges faced by women and minorities in science, as Millie was. Make time for your family, no matter how demanding your career, as she did. Make a special effort to spend time with young relatives. Find something to learn about that excites you, as she did. And don’t keep your motivations a secret. Don’t be afraid to tell the people who matter to you, my friend Millie, or my teacher Millie, or my grandmother Millie, liked to do this and I think she would be glad that I’m doing it, too. The traditional Jewish unveiling ceremony typically includes Psalms or prayers, a recitation of the Kaddish, and the cloth that has covered the headstone is removed. You’ll hear a lot of words in other languages that may be unfamiliar to you. I want to teach you a Jewish word that’s not related to the unveiling ceremony but is relevant to this one. It’s a Hebrew word that doesn’t exist in English. The word is machutanim, and it means “parents of a child’s spouse.” Not only did we lose Millie this year, but this week we lost one of Millie’s machutanim, Maury Drum, the father in law of Millie’s son Paul. Millie’s been gone for just a few months, Maury for just a few days. My mom has been gone for more than a decade and my dad for nearly a quarter of a century. But to this day, my brother and I try to honor them by living in ways that would make them proud. I hope you can all think of ways to make Millie – and everyone else you’ve lost – proud of you, too. May Millie and all of our loved ones rest in peace, and may we continue to honor them in our daily lives.